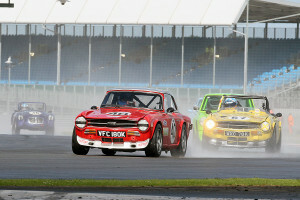 Practice and race for Round 5 of the Thoroughbred Championship was at Silverstone on the Arena Grand Prix circuit just two weeks before the British GP. As usual a great turn out for the Championship with eight extra drivers wanting to compete for a one off. 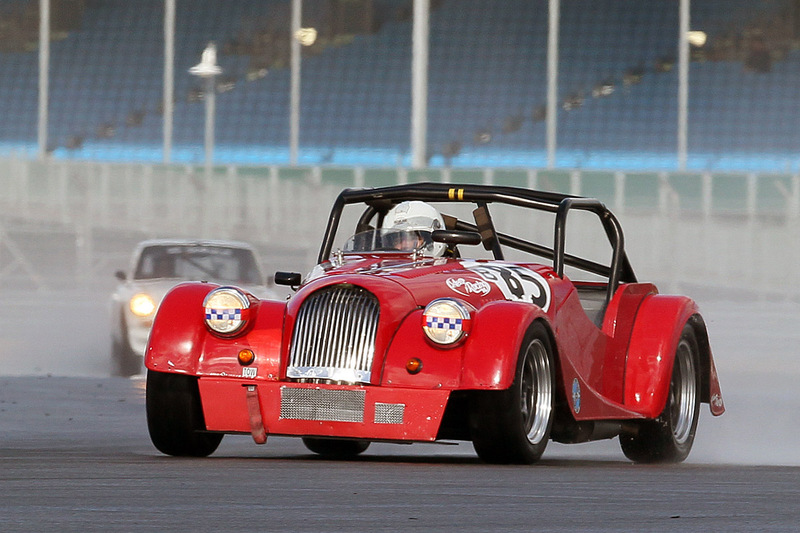 The MGCC’s premier meeting on the Silverstone circuit was supported by the Porsche Club, the Ferrari Classic and the Aero Morgans in addition to the MGCC Championships. There were thirty three entries on the day with eleven class D, six class C, twelve class B and four class A. Qualifying was first on the schedule at 9am and we had to get scrutineered and to the collection area with no race engines allowed until 08.45. There were very late entries from Roy Chamberlain who just managed to finish his car in time and a welcome newcomer to racing Alex Thistlethwayte in an Aston Martin DB4, good to see an Aston back out with us again. They both had serious problems in qualifying when Roy lost control and damaged the front of his beautifully prepared car putting him out of the race and Alex who in his rush to get onto the circuit forgot to clip his bonnet down so had to qualify out of session. 9am First Practice of the day was in wet and cloudy conditions with the track being soaked after an early morning heavy shower. Qualifying itself was for most successful with a few drivers having problems and coming in early. Simon Cripps getting a great time and third overall but had terminal engine problems. All others seemed to sort their problems out for the race. 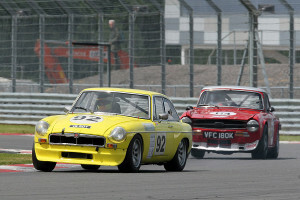 Overall and C Class Pole went to Josh Files in Dad Keith’s TR6 by just .171 from D Class Pole Spencer McCarthy in Dads’ MGBGTV8 (What would we do without our Dads!). The second row being taken by Simon Cripps empty spot and Andy Green in the Morgan. 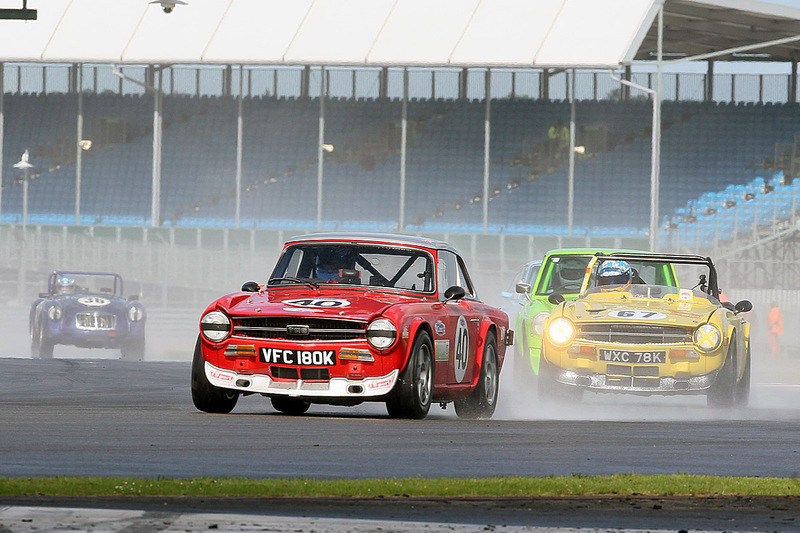 Row three Ian Prior and Jonnie Wheeler and row four Joe Parrington and Jon Ellison in his TR6. Row five Neil Fowler and B Class Pole Babak Farsian and on row six Kevin Swann and Ken Deamer. Just behind, on row seven, Jonathan Upchurch and Peter Barnard with Mark Scott and Neil Cawthorn on row eight. Row nine Colin Jones and Lawrence Wood while on row ten Ben Tovey and Paul Khouri. Behind on row eleven, Terry Burrows and Ben White and on row twelve, invited Ed Foster and David Lamyman. On row thirteen Phil Lambe and Alan Charlton and on row fourteen A class Pole Peter Hiscocks and Alan Kyson with Max Cawthorn and Andrew Moore on row fifteen. Finishing the field, Martyn Clews and Alex Thistlethwayte. The track had dried and the rain had passed on and from the lights Spencer McCarthy from second position took the lead with Ian Prior and Josh Files from pole arriving at Copse third. By lap two Josh was hard on Spencer’s tail both pulling away from the rest of the field and Josh catching round the curvy bits and slipping back on the straights. This went on for four laps with both swapping places frequently until Josh pulled past to take control on lap five, once there he pulled steadily away to come home twenty seconds in front by the flag. A great drive. Spencer hung in as long as he could but slipped back nursing an overheating problem determined to make it to the flag. By lap seven the throbbing Morgan of Andy Green pulled past Spencer to take second overall and first in Class D where he remained to the finish with Spencer taking third. From the lights Spencer McCarthy pulled ahead to lead the field up to Copse with Ian Prior, Andy Green and Joe Parrington lengths behind, next Jonnie Wheeler, then Ken Deamer and a little further down the field Neil Fowler and Lawrence Wood with Alex Thistlethwayte in the Aston making up four places from the back of the grid. By the third lap as they crossed the line the order had changed with Joe coming up to second having passed both Ian Prior and Andy Green, Jon Ellison hanging on behind the group waiting for his chance, change again for lap five with Andy now in class second and Jon third, Joe now in fourth and further down the field Ian Prior, Jonnie Wheeler and Lawrence Wood. Neil Fowler struggling with alternator problems. The Aston of Alex having overheated and retired. Andy Green was pulling in Spencer and saw his chance and took Class lead on lap seven where he stayed to the flag, Spencer taking second and Jon Ellison third, Jon just managing to stay in front of the Ian Prior, Jonnie Wheeler battle by just .100 at the flag. Lawrence Wood had a lonely class race but kept up pace and remained un-lapped by the flag. Class C with Invitation Josh Files coming back from his Clio Championship to try and maintain his three year winning streak in this Silverstone Race did not disappoint. 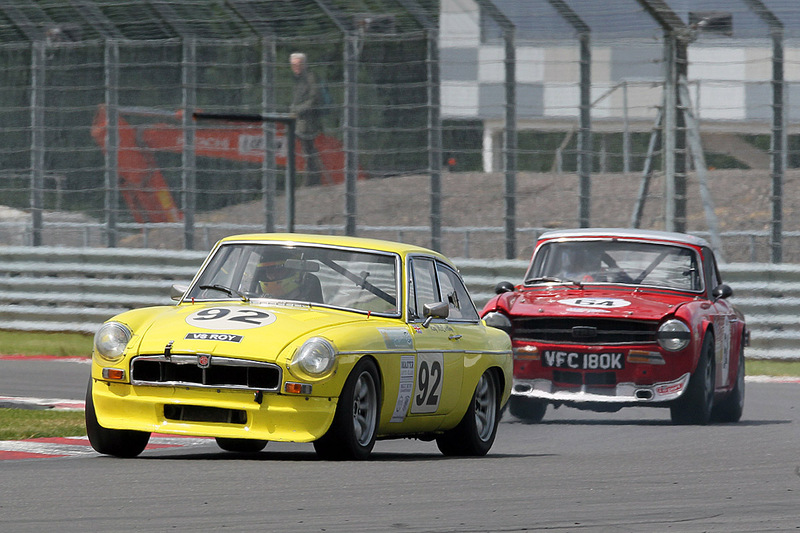 Once past the D Class front runners he was off and came home over a lap in front of his closest class competitor. That was Alan Charlton with just a few seconds further back Ben White and Phillip Lambe. Newcomer to the Championship Jonathan Upchurch in the fluorescent green V8 finishing his race on lap six with problems. The Overall Race went to Josh but the Class Win went to a delighted and surprised Alan Charlton who had just managed to get the car ready for its first outing of the Season and a surprised Ben White who managed third. Regular this Season Phil Lambe came home fourth in class. The biggest class at this meeting and great close racing mid field with Babak Farsian from class Pole swapping places with Peter Barnard for several laps with Colin Jones, Max Cawthorn and Neil Cawthorn having close battles throughout the race. A little further back lonely class races for Kevin Swann, Paul Khouri, Terry Burrows, Alan Kyson and David Lamyman all managing to finish but a lap down. The battling class leaders had a fantastic last few laps with Colin Jones pulling himself up through the field to take class win on the last lap by just .200 at the flag followed home by Peter Barnard, Max Cawthorn, Neil Cawthorn and a little way back a struggling Babak who had developed a problem. Non finishers Ben Tovey who managed ten of the twelve laps who had been having a great battle with Paul Khouri and Alan Kyson and Mark Scott who pulled off with engine problems on lap seven. A great class battle with Colin Jones achieving Commentators Driver of the Race. From class Pole Peter Hiscocks took immediate class lead where he stayed from lights to flag for the first three laps Ed Foster hassling him until his expiry on lap seven with diff problems and a slight mishap by Peter on lap nine and he had Martyn Lewes on his tailpipe, Martyn staying with Peter to the flag but not managing to take advantage. 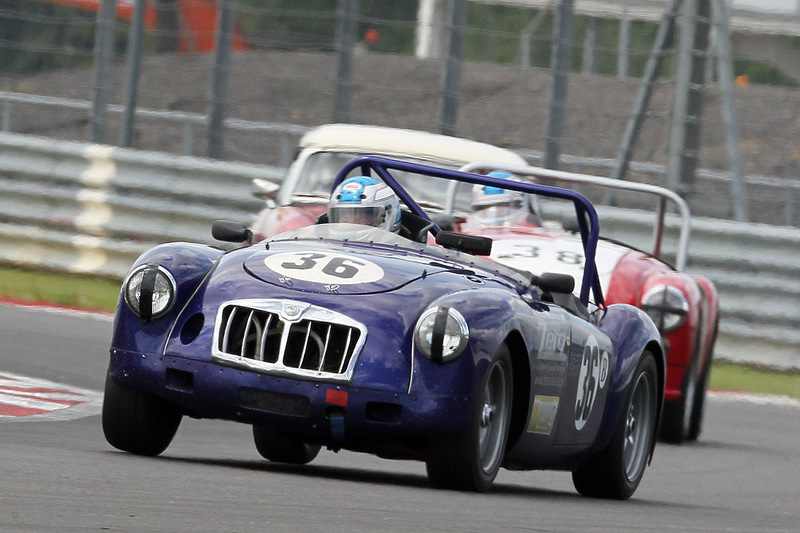 MGA Coupe driver finishing the class. And to Peter Hiscocks for his Class A Win.